Minc was born into the middle-class Jewish family of Oskar Minc and Stefania née Fajersztajn. Minc joined the Communist Party of Poland before World War II. Between 1944-1956, he was a member of the PWP/PUWP Politburo of the Polish Workers' Party. Minc was the third in command in Bolesław Bierut's political apparatus following the Soviet takeover, after Jakub Berman and Bierut himself. He served as the Minister of Industry, Minister of Industry and Commerce, and deputy Prime Minister for Economic Affairs during the Stalinist period in the People's Republic of Poland all the way until the Polish October revolution of 1956. 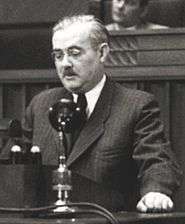 Minc was a close associate of the Polish Communist leader Władysław Gomułka in their joint meetings with Joseph Stalin at the Kremlin. Stalin personally assigned Minc first to the Industry and then to the Transportation ministry of Poland in 1949. He was one of the main architect's of Poland's Six-Year Plan, implemented in 1950. Minc's wife, Julia, was an Editor-in-Chief of the Polish Press Agency until 1954. In 1956, after the Poznań 1956 protests, he was removed from the Politburo. He engaged in a "self-critique" and in 1956 was removed from the Central Committee, and eventually forced to leave the Communist Party. ↑ Andrzej Werblan, New Evidence on Poland in the Early Cold War, "Conversation between Władysław Gomułka and Stalin on 14 November 1945"